Rodrigo Valenzuela’s photographs invite viewers into deliciously confounding spaces. Trouble is, his content can get lost in all that formal complexity. Valenzuela’s series of black-and-white photos, “Hedonic Reversal,” at Steven Zevitas Gallery, consider wealth, poverty, societal decay, and architectural ruins. The photos are complete fictions. Valenzuela builds structures in his studio out of plaster and wood, then he tears them down. The crumbled models may recall a bomb-shattered city, or one eroded due to neglect or economic collapse, but we know they’re made up. Valenzuela poses the question: Do we respond differently to fictitious ruin than real ruin? Yes. I, at least, responded with less empathy and a more critical eye. Theoretical disaster is less compelling than true disaster. Story disappears and form takes over. 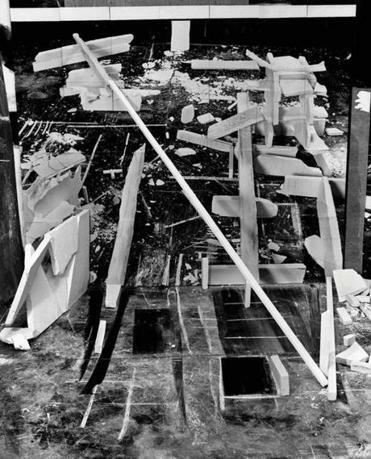 The artist shoots as he works, and he mounts earlier photos behind his toppled plaster bricks and two-by-fours. It’s often impossible to tell where his structures end and the flatter photos and drawings within the photograph begin. Space and time stretch and play tricks in a single frame. In “Hedonic Reversal No. 9,” a 2-by-4 diagonally spans much of the piece; it pops along the surface, but toward the top, it links to a shard of plaster that runs at the same angle in a photo within the photo. With other structures — a vertical plank, an imploding wall — you often can’t tell which is real and which is Memorex. In addition to manipulating space with a painter’s mastery, Valenzuela artfully plays with the essential question about whether photographs depict reality. His social consciousness stands out more starkly in the clip from his video “Maria TV,” which also conflates “real” with “fiction.” In it, several working-class Latina immigrants learn scripts from Telemundo soaps. They are ordinary looking women, not TV stars, so they seem out of place playing overblown, stylized characters. But Valenzuela gives us enough of their backstories to convey a passion that harmonizes with the tenor of the scripts. Real life is a lot less glamorous and heightened than a soap opera, but everyone knows struggle. His drawings — mostly large-scale, sometimes monstrous portraits of imagined or mythical figures — capture the divisiveness of American society, often as ugly and threatening. Thorne expertly uses charcoal and graphite; his skin textures alone are marvelous. “Quetzalcoatl for President 2016” references the Aztec god of wind, the dawn, and learning, who often appears as a feathered serpent. Thorne’s version has a ragged Trump bumper sticker on his forehead: “Make America Great Again.” One eye stares us down; the other looks blind; the mouth is a scar that opens to bloody teeth. The imagery is extreme, but apt — the presidential race is part hard issues, part hot air. Thorne puts faces on the powerful gusts of boasting and fear-mongering. Darlin Frometa traffics in superstition and magic in his solo show, the first at How’s Howard, gallerist John Robert Roy’s more commercial rejigger of the late alternative space Howard Art Project. Frometa’s painting and drawings have a precise, romantic cast. The drawings carry the social posturing of so many 18th- and 19th-century portraits. His figures challenge long-held superstitions; they also cross-dress. They are renegades within the stylistic confines of romanticism. 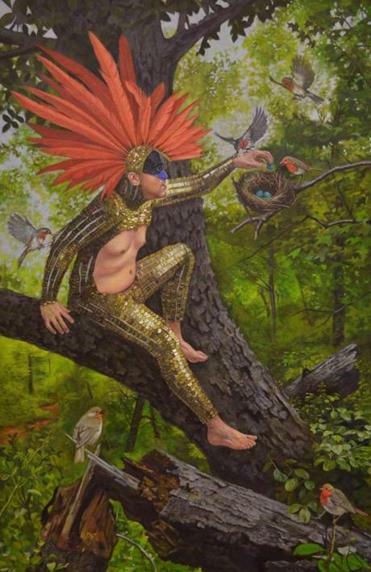 The painting “Stealing From a Robin’s Nest” has a man in an Alexander McQueen jumpsuit, from which Frometa has removed the front to expose a paunchy belly, up in a tree grabbing at robin’s eggs. Here, too, is a feathered serpent: The jumpsuit has gleaming scales; the man wears a red-feathered headdress, and markings on his face mimic a bird’s. Frometa’s figures are all drag queens. He finds in them not merely courage, but tenderness, and an almost mystical heroism. In the charcoal drawing “Broken Mirrors,” a man in heels and a cute little suit open to his navel breaks three mirrors at once. To hell with conventions, he seems to be saying. I’m going to be who I am. South African Jocelyn Chemel makes barbed wire the central motif in her multi-media show at the Mayor’s Neighborhood Gallery at City Hall. It’s a tough hallway space. Brick walls require artworks to be strung from the ceiling. They’re not flush, and hard to light. Chemel’s work largely withstands these obstacles. Barbed wire speaks to South Africa’s history of apartheid and violence, but the image has plenty of resonance here, and anywhere fences are built to keep people out — or in. Her strongest works are digital photographs, sometimes manipulated. “Barbed Scribble” simply traces the loop-de-loop of wire; it looks like chalk on a blackboard, as if it were an elementary school lesson. For “Endure,” Chemel plugs colors used by the once-powerful Ndebele tribe into the bleached-out grid of a fence, with ghostly outlines of wire twisting in front. 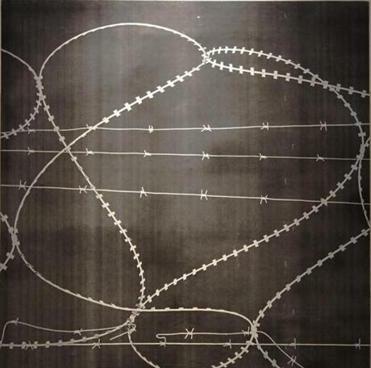 Other works needlessly include text; barbed wire sends a strong enough message without it.